People in the streets, green clovers falling from the sky, Guinness being passed around the crowd, it’s time for St Patrick’s Day! The day for the Patron Saint of Ireland is one celebrated not only on the Emerald Isle but around the UK and America. In this month’s newsletter we look at the history of the celebration, the traditions, and what you can discuss with Breadies during class! So who is Saint Patrick and why do those with Irish heritage celebrate his life in such a big way each year? Thought to have lived in the 400s, Saint Patrick, born Maewen Seccat, was not actually Irish, but actually born in Wales or Scotland, the then Roman Britain. Born into a wealthy family, he was kidnapped as a child and sent to Ireland where he was forced to work as a shepherd. The true beginning of Saint Patrick’s story begins when one day the voice of God came to him telling him if he travelled through Ireland, he would find a ship to return him home. He followed that voice and a few months later found himself back with his family. Maewen Seccat was changed however by his experience and could no longer stay in the comfort of his home. The calling of God sent him to France where he lived in a monastery and eventually returned to Ireland, where he felt the people needed him. St Patrick travelled the Emerald Isle, helping the poor and sick and teaching anyone who would listen about the Christian God. He wanted the Irish to let go of their paganism and belief in numerous deities; but instead of forbidding their traditional practises, he incorporated them into Christian festivals. During Easter, for example, he would lead mass bonfires, a pagan tradition to welcome the gods in Ireland. Slowly, his work gained respect and as he travelled through Ireland, many pockets of the population decided to switch from traditional beliefs to those of Jesus. Perhaps the most famous story surrounding Saint Patrick was connecting the Holy Trinity of Christianity with the three-leaf clover, each leaf symbolising the Father, the Son and the Holy Spirit connecting the religion directly with something so treasured by the people of Ireland. It is because of this that St Patrick’s Day is often adorned with images of the little green plant! A famous myth surrounding the Patron Saint is how he drove all the snakes from Ireland after they attacked him whilst fasting. This story is often told to children to learn about Patrick, and some believe that it is for this reason that there are no native snakes in Ireland, however many see the snakes as a metaphor for the paganism and pagan rituals that were practised across the country. These days, the religious element of St Patrick’s Day has been overtaken by a general celebration of the Irish. It is a day synonymous with the colour green, drinking Guinness, and listening to Irish folk music. 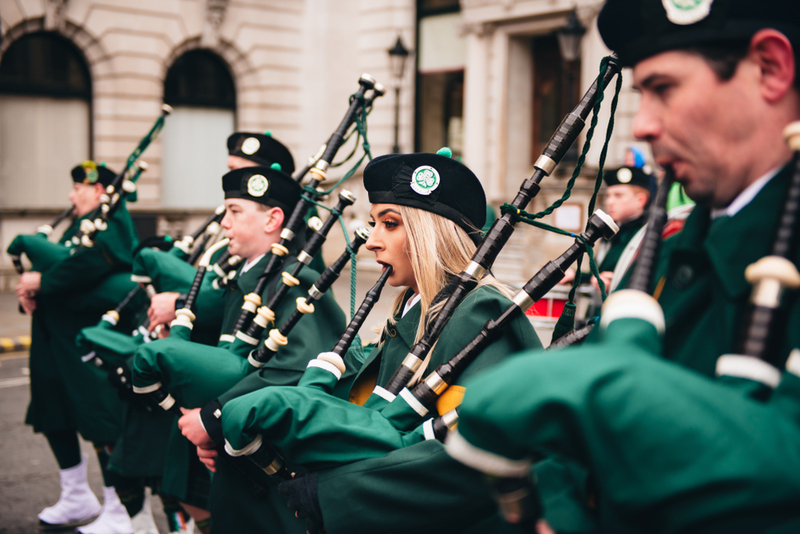 Although traditionally Irish, St Partrick’s Day is celebrated all across the UK and around the world, with the biggest parades and festivities actually happening in America! The first St Patrick’s Day parade in fact took place in New York city in 1762 due to the large migrant population there. In the city of Chicago, the city council turns the whole river green to celebrate the day! In Ireland, the biggest celebrations happen in the two capital cities; Belfast in Northern Ireland (part of the UK) and Dublin in the Republic of Ireland. So what traditionally happens on St Patrick’s Day? Aside from drinking lots of Guinness (which is perhaps not the best topic to discuss with Breadies!) the biggest tradition on St Patrick’s Day is to wear the colour green and to wear big hats and a fake orange beard to look like a leprechaun. It is common to find Irish folk bands playing in pubs and events and people will attempt to do an Irish jig! I type of dance where you hop from foot to foot. These are not solely linked to St Patrick’s Day per se but they could be good topics to share with your Breadies surrounding both Northern and the Republic of Ireland! These small fairies are one of the most popular images of Ireland. With their green outfits, long ginger beards, and mischievous personalities, the leprechauns have long since been a cultural image right across the UK. The story goes that after the Vikings sieged Ireland, looting and plundering any village they discovered, they left gold and stolen treasures buried in the country. The leprechauns, seeing how the treasure had been taken unethically decided to keep it hidden underground, guarding it from those who also may want to do wrong. The only way to find the gold is to wait for a rainbow, as the pots are hidden where the rainbow ends. You may hear people talking about ‘a pot of gold at the end of the rainbow’ - now you know why! 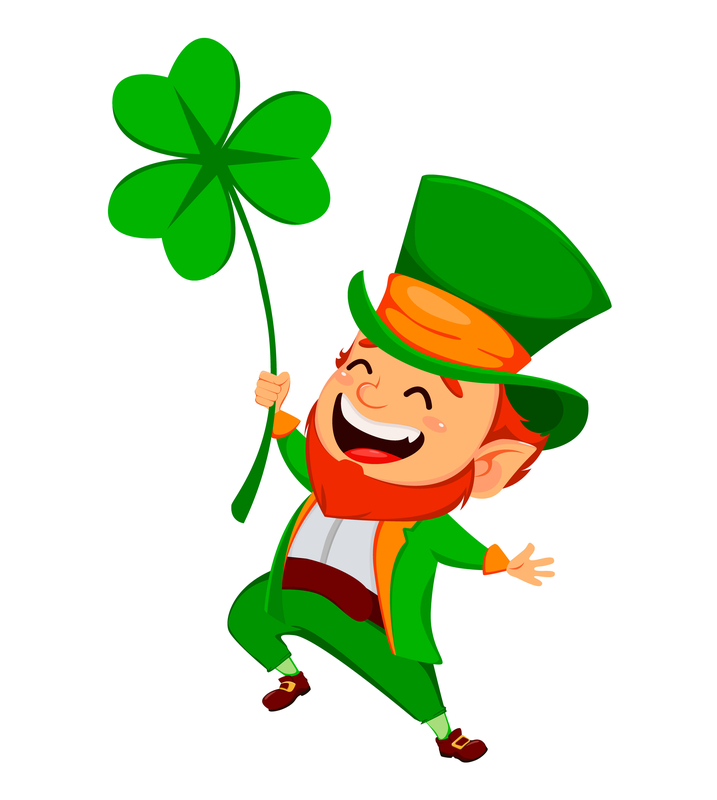 Interestingly, in Irish folklore leprechauns traditionally wore red, but as Americanised St Patrick’s Day took over, and the colour green epitomised everything Irish, so too did the leprechaun’s suit turn green. We’ve already mentioned the clover and St Patrick’s link to the Holy Trinity, but what about the cultural significance of the clover, known in Ireland as shamrock, and it’s mystical sibling the four-leaf clover? The shamrock is thought to come from the Gaelic word ‘saemrog’ which means ‘little clover’. The three leaves represent the three qualities of Ireland, faith, hope and love. The four-leaf clover on the other hand, is different. Although also a clover, it is the rarity of this mutation that gives it luck. It is estimated that the chance of finding a 4-leaf clover is 1 in 10,000! We know that many of our Breadies in China love to discuss food, so why not look at a few traditional Irish dishes too which can be discussed in class! Ireland’s recent history is one that it is intertwined with the potato. First brought to Europe by the Spanish, the cheap and relatively easy to grow tuber became a staple in the Irish diet along with cabbage. 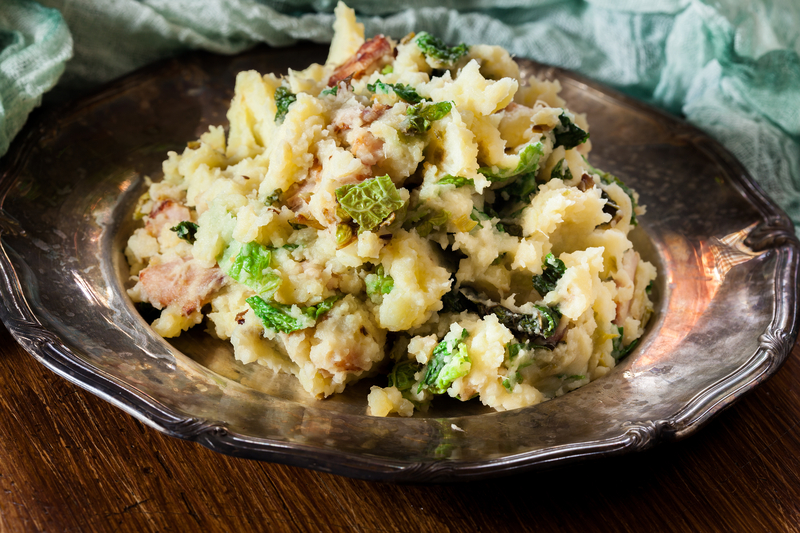 A common Irish meal is colcannon, mashed potato mixed with cabbage, spring onion and eaten with Irish bacon. A similar dish is farl, a small fried cake made from mashed potato and is also eaten with bacon on the side. Another popular dish is Irish stew; meat and vegetables all cooked together for a long time in a pot. Very similar to dishes cooked in China but perhaps less spicy!